And the U.N. itself should stop funding schools where the core curriculum is focused on teaching Palestinian children hatred of Jews and their state – along with training in hand-to-hand combat, firing guns, kidnapping and sending kites and large balloons into Israel carrying bombs. With this kind of indoctrination going to children from the elementary school years onward, it’s no wonder that the fires of hatred against Jews and Israel burn in Palestinian hearts. Mr. Secretary-General, Palestinians don’t need 14-page reports with action plans to “protect” them from Israel. They need you to summon up the courage to tell the truth. Want peace? Get rid of the terrorists; stop brainwashing children into a culture of death; tell Mahmoud Abbas to start acting like a president who wants peace and not war; stop treating terrorists like rock stars; and stop rewarding murderers. In the extraordinary unlikely event that Guterres made such a declaration, there could be hope that both Palestinian and Jewish children may actually have a peaceful future. But sadly, the chances of the U.N. coming out for steps like this anytime soon are almost nonexistent. We can only pray and hope that at some point – with the help of strong leadership from the United States – the U.N. and more of its member states will come out for a just and equitable peace that will allow Israelis and Palestinians to live side-by-side in peace and security. In a rare broadcast on Palestinian Authority TV, a 13-year-old Palestinian boy and his parents openly criticized Hamas. They described how six Hamas fighters in Gaza beat and tortured the 13-year-old - simply because he had fought and hit the son of a commander from Hamas' military wing Izz Al-Din Al-Qassam. To a degree, this isn’t surprising. EU member states have only been able to coalesce around one common foreign policy: hostility to Israel. Only last week, the EU issued an angry condemnation of Israel for announcing it was issuing permits for 382 new homes in its communities in Judea. The EU and European member states invest in excess of $125 million annually to support networks of anti-Israel NGOs in Israel, the Palestinian Authority, and Europe. These NGOs delegitimize Israel’s right to exist, support economic boycotts of Israel, work to turn Israel’s Arab citizens against their state, and support Palestinian terror groups. At the UN, there are few anti-Israel initiatives that do not pass with European support. Since the OPEC oil embargo in 1974, Western European countries have used their hostility towards Israel as a means to distinguish themselves from the U.S. It costs them nothing, since Israel is at a trade disadvantage with Europe. And it appeals to the antisemitic and anti-American sentiments held by a large percentage of Europeans. How odd, given the German government’s decision to pin its independence on its ability to help Iran’s regime overcome U.S. sanctions and develop the means to annihilate Israel and murder the six-and-a-half million Jews that live there. BESA: Is a Historic Decision on UNRWA Imminent? For the past few decades, the West has treated the Arab-Israeli conflict as a territorial dispute. Since the June 1967 war, the prevailing motto was “land for peace,” which meant that in return for territory, Israel would receive peace from its neighbors. An American decision to withdraw from UNRWA would signify that the US believes the dispute to be not territorial but existential. By addressing the core ethos of the Palestinians – that the entire land is theirs, and therefore all “registered refugees” should be entitled to “return” – the Trump administration could make an invaluable contribution to Israel’s security as well as to the prospects for future peace. Only by dealing directly with the intransigent worldview of the Palestinians, as epitomized by the “refugee” problem and the Palestinians’ demand for the “right of return,” will peace be possible in the future. This would be the first time the Palestinians pay a price for their intransigence. Up to now, they have been encouraged to harden their position every time they refuse a peace deal offered to them by Israel. When they said no to Ehud Barak’s peace proposal at Camp David in July 2000, they received a better offer from Bill Clinton a few months later. When they refused that offer, they were offered another, still better deal by Ehud Olmert in 2007-2008. They refused that offer as well. The inner logic of the peace process until now was that the Palestinians might as well keep on saying no, since doing so brings them better offers. If Trump pulls all US funding from UNRWA, he will break this twisted logic. The message will be: If you are going to turn down peace proposals, do not expect better ones to follow. Intransigence breeds less negotiating power, not more. By withdrawing from UNRWA, the Trump administration is trying to take the refugee problem off the table – a sensible move, since it has always been a non-starter. There is wide consensus in Israeli society not to allow Palestinian “registered refugees” to “return” to Israel, so the Palestinian demand for a “right of return” – their standard code word for Israel’s destruction through demographic subversion – has blocked every attempt at peace negotiations in the past. An American decision to stop supporting UNRWA would be an announcement that the US understands that the “refugee problem” is a political disguise for the Palestinians’ real aim, which is to dismantle the State of Israel entirely. Removing this disguise would do a huge service not only to the cause of peace but also to the security and future of the Jewish State. In a dramatic move vastly expanding previously announced foreign aid cuts, the Trump administration has reportedly decided to end all funding to UNRWA, the UN agency responsible for Palestinian humanitarian assistance. The decision to cut all aid to the UN’s Relief and Works Agency for Palestine Refugees was made at a meeting earlier this month between US President Donald Trump’s adviser and son-in-law, Jared Kushner, and Secretary of State Mike Pompeo, Foreign Policy reported Tuesday night. The Trump administration is supposedly considering declassifying a State Department report that tallies up the true number of Palestinian refugees. If it does, the repercussions could go a long way toward settling the Arab-Israeli conflict. The way UNRWA, the United Nations Relief and Works Agency for Palestinian Refugees, classifies those refugees is unlike that of any other organization in the world, and contradicts common sense. Whereas the number of refugees from the original 1948 Arab-Israeli war would likely number in the tens of thousands, UNRWA also counts their descendants, many of whom are citizens of other countries, in addition to everyone living in their internationally recognized homes in the Gaza Strip and the West Bank. This politically motivated definition raises the number of "refugees" to an estimated 5.3 million, and this is the number the Palestinians claim a "right of return" for to Israel – a number that amounts to more than half Israel's current population. Commenting on one of the most sensitive and inflammatory issues of the Israel Palestinian conflict, Haley suggested the Trump administration would consider an official rejection of the Palestinian demand that all refugees who were displaced between 1947 and 1948 — as well as all of their descendants — be allowed to return to modern day Israel following a final peace accord. “I absolutely think we have to look at right of return,” she said during an appearance at the Foundation for the Defense of Democracies, a DC-based think tank closely aligned with Israel. US President Donald Trump’s ambassador to the United Nations questioned on Tuesday the credibility of Palestinian claims to a “right of return” to lands in modern-day Israel, touching on one of the most sensitive topics in the Israeli-Palestinian conflict. Accepting an honor at the Foundation for Defense of Democracies, Nikki Haley was repeatedly asked by Clifford May, the organization’s president, to comment on reports that the administration will soon target the United Nations Relief and Works Agency, a body which treats the descendants of refugees from 1940s Mandate Palestine as refugees themselves, by cutting the rest of its funding to the body and challenging its qualifications for refugee status. The Trump administration has already cut much of its funding to UNRWA, and Haley’s response suggests a complete cut is in the offing. US Ambassador to the United Nations Nikki Haley on Tuesday questioned the figures on “Palestinian refugees” being offered by the United Nations Relief and Works Agency for Palestine Refugees in the Near East (UNRWA), suggesting they are significantly inflated. Speaking at the pro-Israel think tank Foundation for Defense of Democracies, Haley was asked by FDD President Cliff May about the US relationship with UNRWA, following the restrictions imposed on the agency by the White House and statements from President Trump and others in the administration questioning its viability. UNWRA claims to provide services to five million “Palestinian refugees,” the vast majority of whom were not yet born in 1948. Most are descendants from individuals who fled their homes in Israel’s 1948 War of Independence. U.S. Ambassador to the United Nations Nikki Haley defended her broadsides against the United Nations' anti-Israel actions during an interview Tuesday. Haley was accepting the Jeane Kirkpatrick Award from the Foundation for Defense of Democracies when she talked about the numerous anti-Israel resolutions and sessions the United Nations has held. She said she expected bias against Israel but was still surprised at how deeply it runs through the U.N.
"I knew that there was a bias against Israel, but I hadn't really put a lot of the thought into it until I attended the first session," Haley said. "And when I saw literally how abusive all of those countries were being to Israel, in a way that was pathetic, really, I had no choice but to get up and say this is completely wrong." She said the groupthink at the U.N. reminded her of how schoolchildren behave. "It's like that kid in the schoolyard who gets bullied and everyone's bullying that kid just because they think that makes them stronger. I wasn't going to stand for that," Haley said. 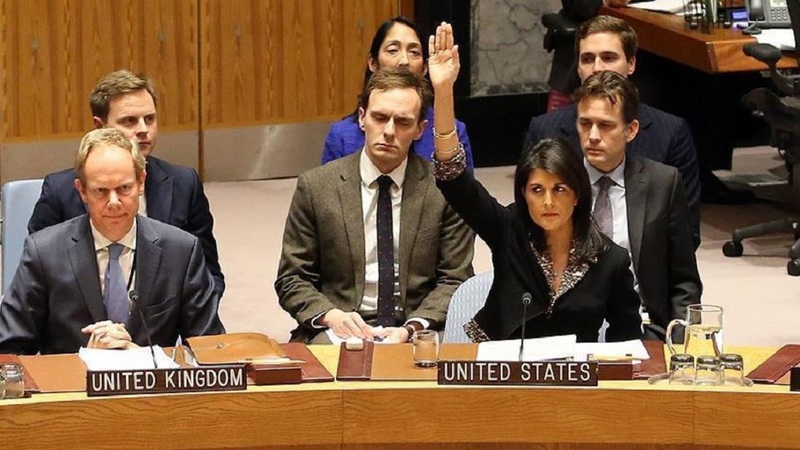 “We would love to have some sort of resolution in the Security Council,” Haley added, though acknowledged that Russia, a permanent member of the council, could veto such a measure. Russia vetoed a similar Security Council resolution in June. Recent moves of the US administration on the Palestinian arena (deducting $200 million from US aid and probably adopting a new approach on Palestinian refugees) are signs that as we approach the 25th anniversary of the Oslo Accords (signed on September 13 1993) there are finally international players that are ready to call a spade a spade. In this spirit, it is high time to admit that the Palestinian Authority, the main product of the agreements, is a “terror sponsoring entity” committed to the Palestinian struggle aimed at completely rectifying the injustice it sees in Zionism. It was like that from the day it was established and it promises to stick to this identity in the future. Yet, until recently we were willfully blind to it. The PA, repeatedly declares that it is determined to keep paying salaries to terrorists arrested in Israeli prisons or released from them, as well as to the families of terrorists who died while performing their terror attacks. PA chairman Mahmoud Abbas stated that “even if we are left with one penny we are going to use it to pay the salaries to the (terrorist) prisoners”. This came in response to the American and Israeli awakening to the reality about the PA, as represented in the “Taylor Force Act” that denies American aid to the PA until it stops paying those salaries and revokes the law according to which they are paid. In a similar vein, Israel adopted an equivalent law that deducts from the taxes collected by Israel and transferred to the PA the sum it pays to the terrorists. (Both laws were recently enacted but were not yet implemented. According to a press report American officials explained that the cut in US aid was intended to avoid the need to activate the Taylor Force Act). U.S.: Assistance to PA "Does Not Provide Value to the U.S. Taxpayer"
"MS NAUERT: Earlier this year, and you all recall this – I know we received a lot of questions about this issue – the President directed an overall review of U.S. assistance to the Palestinian Authority in the West Bank and also in Gaza to ensure that U.S. taxpayer dollars were being spent in accordance with U.S. national interests and then also providing value to the U.S. taxpayer. MS NAUERT: -- when she talked about the importance of burden sharing. And that is we believe that the United States alone does not have to shoulder a disproportionate share of financing programs overseas. The United States is the most generous country in the world, and we continue by and large to be the most significant donor to many programs around the world. But we also feel that other countries should step up and take responsibility, and that's a key point of what the President has discussed..."
Palestinian Authority President Mahmoud Abbas said that he does not support a solution to the contentious issue of Palestinian refugees that would “destroy Israel,” according to two Israelis who met with him on Tuesday and spoke to The Times of Israel on Wednesday. “He told us that he does not support or want a solution to the issue of refugees that would ‘destroy Israel’,” Ilai Alon, a professor at the Interdisciplinary Center Herzliya and a fluent Arabic speaker, said in a phone call. Abbas’s remarks came amid reports that the US will “essentially abrogate” the Palestinian demand for a “right of return” for millions of Palestinians designated as refugees by the UN, and that it will defund the UN body that handles the refugees, the United Nations Relief and Works Agency. As reported earlier, Abbas also told the Israelis he met with on Tuesday he believed a future Palestinian state should be demilitarized, offering rare backing for a key Israeli demand in any peace deal. An associate of Abbas confirmed to Kan that Abbas had made the comments, and said that his words were in line with his previously stated positions. Opposition leader Tzipi Livni confirmed that Abbas had voiced support for a demilitarized Palestinian state in peace negotiations she held with him between 2013-2014, during Netanyahu’s third government. Those negotiations, shepherded by then US secretary of state John Kerry, eventually fell through. A 2013 Haaretz report quoted Abbas as saying an Palestinian state would be demilitarized. In 2014 he told The New York Times that he envisioned NATO forces acting as border guards and combating smuggling. Israel’s legendary foreign minister Abba Eban is often quoted as having said that: “The Palestinians never miss an opportunity to miss an opportunity” and “The Arabs never miss an opportunity to miss an opportunity.” This week, yet again, some Israeli Arab MKs joined Palestinian leaders in choosing lawfare over the chance for progress. The revelation by Israel’s ambassador to the UN, Danny Danon, that members of the Joint Arab List would be joining the Palestinian Authority in a petition to the UN against the recently passed Nation-State Basic Law managed to do something rare in this country’s fractured political environment – unite MKs from Left, Center and Right in condemnation. The Hadashot News site reported that the Palestinian ambassador to the UN, Riyad Mansour, is trying to advance a resolution next month that likens the legislation to apartheid. A satirical video released by the Tzabar group in cooperation with the Derech Chaim movement today portrays an Arab Knesset member in his Knesset office and speaking in the plenum, wandering around the Knesset and freely inciting against the State. The repeating refrain throughout the video is "Democracy here is a celebration, there's no country like it." In the video, the Knesset member participates in a demonstration to liberate "Palestine" with PLO flags, pushes a policeman who came to maintain order in the area, participates in the Gaza flotilla that includes "a few blows with soldiers", and comforting terrorist's family members calling out "So come on, give us more missiles!" The Knesset Member is also portrayed in his office displaying a picture of Abbas, encouraging Hamas in its war against Israel, smuggles cell phones into jail because "with immunity I can do anything", and ending with the sentence "When the Knesset salary comes in, I let out one big laugh." Former Jordanian PM Abdelsalam Al-Majali defended the Israeli-Jordanian peace treaty, saying: "My mentality is a mentality of peace," and talking about the fundamental issues that Jordan had achieved through the treaty. Jordan, he said, had got its land and water back and had restored its economy. "Israeli continues to give us more water than we are due," he explained to the Jordan Today TV interviewer. "As for the Palestinian quota - we don't intervene." On the question of the Palestinians' Right of Return, he said: "The Arabs do not have any power. If we ever have military power, will we let them keep Haifa? We'll take it. If tomorrow, we become stronger and can take Haifa by force, will we really decline just because we have an agreement with them?" The interview aired on August 18, 2018. Prime Minister Benjamin Netanyahu called new Australian Prime Minister Scott Morrison on Wednesday to congratulate him on his new position, inviting him and his wife to Jerusalem. Morrison took over the premiership on Friday after the Liberal Party pushed out Malcolm Turnbull and voted in the former treasurer Morrison to replace him. According to the Prime Minister’s Office, the two leaders emphasized the excellent relations between the two countries and agreed to work to further strengthen security and economic ties. Netanyahu and Turnbull had a strong working relationship, with Netanyahu being the first sitting Israeli prime minister to visit Australia, when he did so in February 2017. Nine months later Turnbull visited Israel to take part in the centenary ceremony of the Battle of Beersheba. Azaria's trial and subsequent conviction sparked a heated public debate that all but split the country in half. Many were outraged by the conviction, arguing that Azaria was a hero who did the right thing by taking the fight to the enemy, while others said his decision to shoot an injured and incapacitated terrorist who was probably no longer a threat was a stain on Israel's military. "I am at peace with what I did, I acted properly and followed my inner truth. I did the right thing and this affair shouldn't have become what it did," Azaria told Israel Hayom. "I have no remorse whatsoever," he stressed. Following a foiled terror plot in Paris earlier this summer, France is restricting diplomatic travel to Iran, Reuters reported Tuesday, citing an internal memo it obtained. One of the reasons for the advisory telling diplomats to suspend travel to Iran except for urgent matters, was a foiled bomb plot that targeted an Iranian opposition group in June. Four people were arrested in connection with the bomb plot, including an Iranian diplomat who was arrested in Germany. Previously, Austrian Airlines cancelled flights to Shiraz in the wake of the attempted terror attack. The diplomat arrested in connection with the plot was based in Austria. “The behavior of the Iranian authorities suggests a hardening of their position vis-a-vis our country, as well as some of our allies,” Maurice Gourdault-Montagne, the secretary general of France’s foreign ministry, wrote in last week’s memo. The recent arrest of two Iranian agents alleged to have been running spy operations on U.S. soil is just "the tip of the iceberg" in terms of the Islamic Republic's efforts to conduct intelligence operations in America that could result in a terrorist attack, according to a leading lawmaker and U.S. officials who spoke to the Washington Free Beacon about the matter. While the arrest of the two Iranians was met with shock in the press, Roskam said he was not surprised by the arrests, which have unearthed concrete evidence of the Islamic Republic's efforts to foment discord across the globe, including on American soil. "This is the tip of the iceberg," Roskam said in an interview. "This is not a surprise and this is a result of the Iran regime getting financial support from the Obama administration in the Iran deal." Iran has been emboldened by the lack of international repercussions on its malevolent behavior and may have increased its intelligence operations in America in the years since the landmark nuclear deal, he said. Iranian Supreme Leader Ayatollah Ali Khamenei said Wednesday that his government should be ready to “set aside” the 2015 nuclear deal if it is no longer in the country’s national interests. “The JCPOA (nuclear deal) is not the objective, it is only a means,” his website quoted him saying at a cabinet meeting, using the initials of the agreement’s formal name. Khamenei said talks should continue with Europe, which is trying to salvage the 2015 agreement despite the withdrawal of the United States. “We must examine their promises with skepticism,” he added. In a rare statement, Iran’s intelligence minister on Tuesday seemed to confirm that an Israeli ex-minister arrested this year and charged with spying for Iran was in fact Tehran’s agent, after earlier denials. “You have recently heard that we brought under our control a member of a cabinet of a powerful country,” Mahmoud Alavi told the semi-official ISNA news agency, according to Reuters. Though he didn’t specify what country he was referring to, Iranian news sites and many commentators took that as a first admission of ties to former Israeli energy minister Gonen Segev, who was arrested in May and extradited from Equatorial Guinea to Israel. He was charged by Israel in June with “aggravated espionage” as well as assisting the enemy in wartime, attempted aggravated espionage and dozens of counts of attempting to provide information to the enemy, making him the most high-profile figure to be accused of spying in the country’s history. During an interview with Lebanon's Mayadeen TV, Iranian Defense Minister Amir Hatami said that under a new Iranian-Syrian agreement, Iran would help Syria rebuild whatever military forces and industries it deems necessary for its national security, and that Syria and its allies would respond to any aggression. Hinting at Russian military presence in Syria, he said that other nations have "no right to express an opinion" on Iranian presence in Syria. Hatami added that "no country uses chemical weapons when it is winning," and said that the Iranian people chant "Death to America" because of American injustice towards them. The interview, held in Damascus, aired on August 27. In a Friday sermon delivered at the Masjid Al-Huda Islamic Center in Minneapolis, Minnesota, on August 3, 2018, Sheikh Shaaban Aboubadria mocked women who “want to uncover their hair, wear makeup, and become a commodity.” “Allah ordered [women] to cover up their beauty and not display it,” he said, berating men who allow their wives to do so: “When men turn into she-camels and stop performing their role, their wives go naked and all dolled up.” Sheikh Aboubadria, who serves as the mosque’s imam, added: “Many men have no authority at home but over a single remote control.” In another Friday sermon, delivered at the mosque on March 30, Sheikh Aboubadria complained that in the West, which sends airplanes, tanks, and rockets to wipe cities out of existence, “they only care about dogs and cats, even though Man is the greatest of all creatures.” In his April 27 sermon, he talked about interfaith marriage, saying that while Muslim men may marry non-Muslim women, “for her own good, a Muslim woman must marry only a Muslim man, because guardianship is in the hands of the man.” The sermons were published on the Masjid Al-Huda YouTube channel.